Affordable promo offer from Talk N Texts to loyal subscribers! 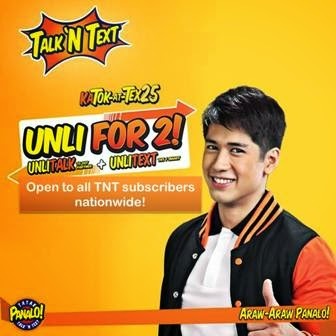 TNT KaTok-at-Tex25, Unli for 2! Enjoy sending unlimited talks (TNT calls) and unlimited texts to all TNT/SMART friends, for as low as P25.00, valid for 1 whole day! Want to subscribe to this promo? Send the given promo code below. Wait for confirmation message for further information. Enjoy your unlimited calls and unlimited texts! Open to all TNT subscribers nationwide.